We now support importing trades from MB Trading! 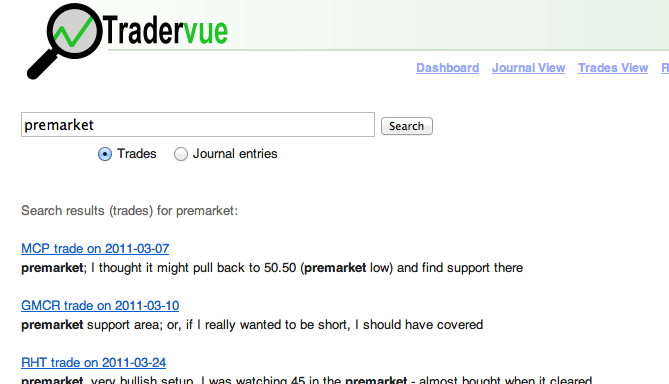 If you’re using MBT Desktop Pro, just go to the Tradervue Import Page, and follow the instructions. This is not the same thing as filtering trades. The filter allows you to narrow the scope of trades being analyzed, so you can generate reports on a subset of your trades (for example). The search feature is separate from the filter, and allows you to find your trades and/or journal entries based on your notes; search will not limit itself to, nor will it change, the current filter. Search is available now, for all users! If you’re using the chart studies available on Tradervue’s price charts, you’ll see a new one on the list…Keltner channels! 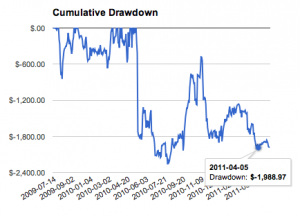 Here’s some information about Keltner Channels if you haven’t used them before. If there are other studies you’d like to see, let us know! Tradervue now supports importing trade data from MultiCharts! To import your trading data, just go to the Tradervue import page, choose MultiCharts, and follow the instructions. The statistics at the top of the Detailed reports tab now includes Profit Factor. It is also on the Win/Loss Days tab and the Compare tab, for each trade group. Where net profits and losses are the gross profits/losses, less commissions and fees. 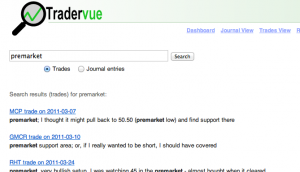 You can now embed YouTube videos in your trade notes. 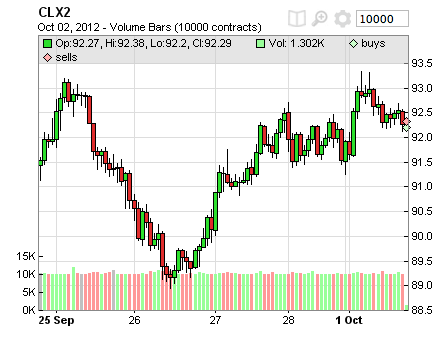 To do that, just paste in the link to the video, and Tradervue will do the rest! We have also changed the way we embed images; when you add an image to one of your trades, we will display it to fit within the notes area of the trade. If the image is shown at smaller than its normal size, we will auto-link it to the regular full-size version. Here’s an example of a shared trade in NQ with both a large image and an embedded video. You can also filter by tags, including multiple tags at a time, to help narrow down the trades you’re reviewing or analyzing. 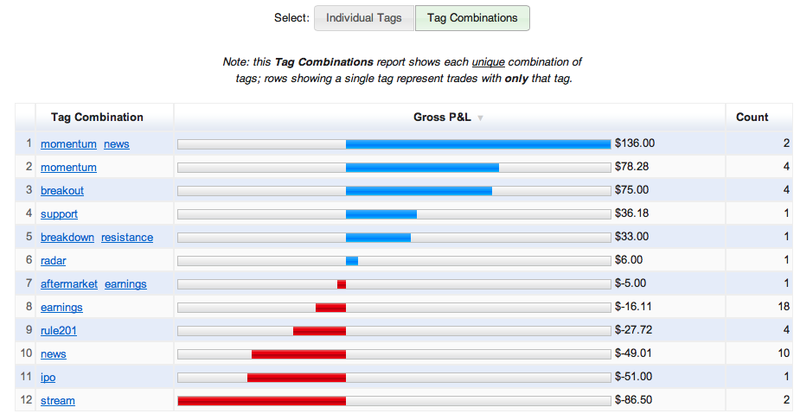 You can combine this Tag Combination report with tag (and other) filters, as you would expect. 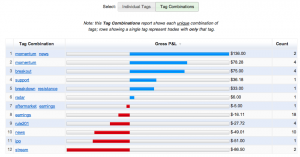 This new tag combination report is available now for all Silver and Gold users. If you haven’t tried all of the reporting and analysis capabilities of the silver or gold plans, you can try them out with a free 7-day trial! 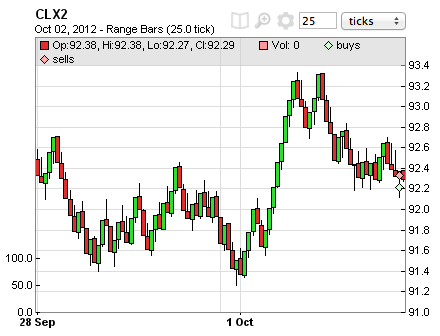 Tradervue has always auto-generated price charts for your trades, on multiple timeframes, with your executions plotted. Now, we have greatly expanded this with three new chart types! In the above example, we’re showing a 25-tick Renko chart for CLX2. The bar size can be specified in either points or ticks. 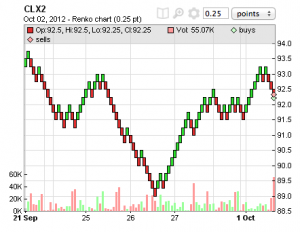 Renko charts are not time based – each bar may represent an arbitrary amount of time. Executions are plotted on all chart types, and studies are available for all of them as well. To change a chart type to any of the above, or to switch between Candlestick and OHLC, click the gear icon at the top of each chart. You can also change the chart defaults to include these new chart types in your Chart Settings – from the Tradervue Dashboard, click Settings, then go to the Chart Settings tab. These new charts are all available today – Renko, Range Bar, and Volume Bar charts are available for silver and gold subscribers, and Candlestick and OHLC charts are available (as before) for all users. You can find this new report on the Detailed reports tab, Win/Loss/Expectation group (quick link). You can also find it on the Compare reports tab, also in the Win/Loss/Expectation group.